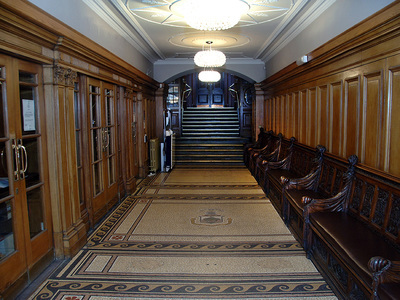 To visit the Trades House of Glasgow website, please click on the button below. 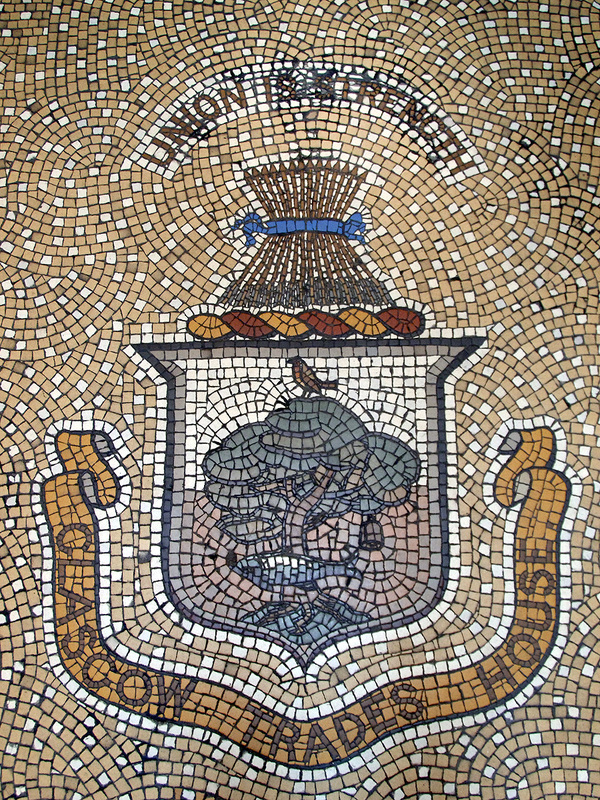 Mosaic entrance to the Trades Hall. 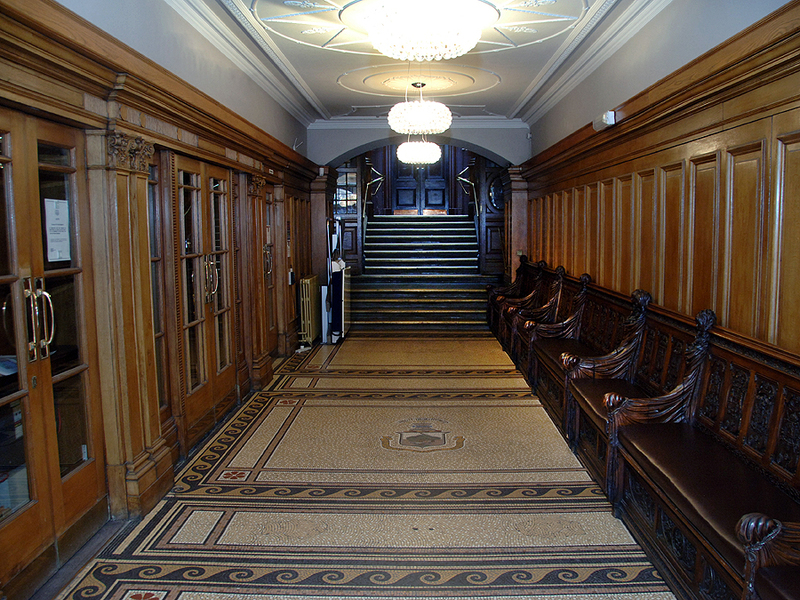 The entrance hall has changed much from Adam's original design where he envisaged a cross-vaulted ceiling. After his death in 1792, it is possible that his brothers James and William may have made alterations when completing the building after Robert's death. The present ceiling probably dates from the 1930s when this passageway was reconstructed. 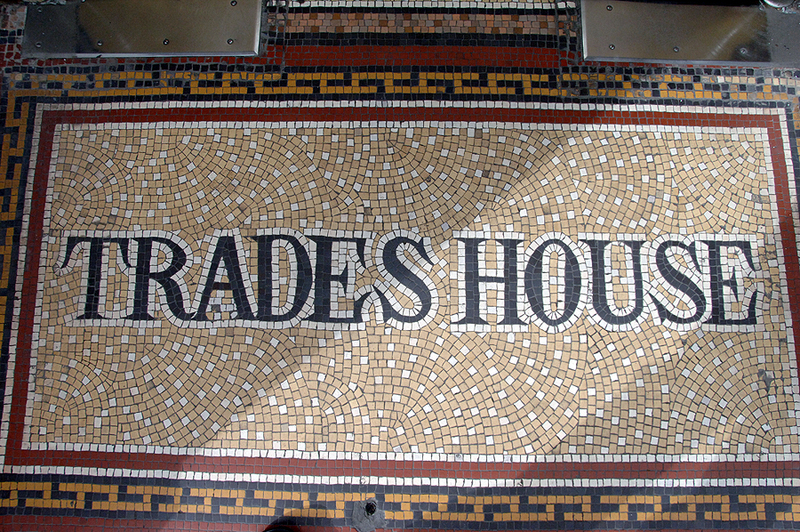 The floor is an intricate ceramic mosaic and just as you enter the building the name of the building can be clearly seen. The Trades House Armorial Bearings showing the sheaf of 14 arrows representing each if the Incorporations. 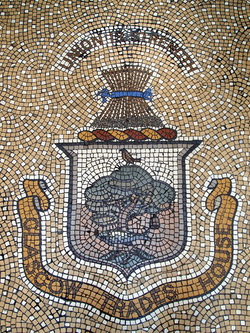 About halfway down the hall the Arms of the Trades House can be seen with the fourteen arrows representing each of the fourteen Incorporations with the motto "Union is Strength" above the arrows. The Arms of the Trades House are often mistaken for the City of Glasgow's Arms, but the red field makes it clear that this is the Arms of the Trades House. The symbolism of the fourteen arrows is quite strong as an arrow on its own is weak, but fourteen together are strong. The view of the entrance hall both from the door and from the stairs is rather imposing, especially at a colourful event when the Deacons and their guests are sporting the tartan at the black tie dinners. 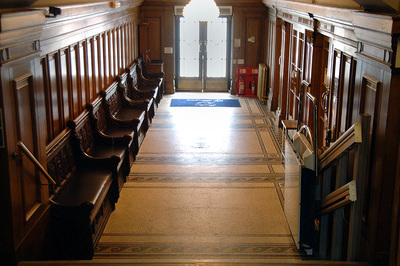 The keen observer will notice the long carved oak benches running the length of the hall, which are much used by weary revellers after many a dinner. There are two benches and they were made by Belgium woodcarvers who were refugees in Glasgow during the First World War. Alexander Walker, a former Deacon of the Cordiners donated them to the Trades House in 1937. For a closer look at the marvellous carvings and the old crests of the Incorporations and other bodies, please click here.